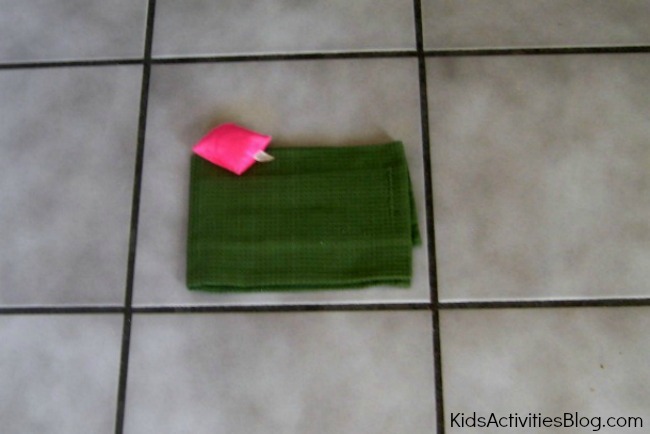 Simple games can be a boredom buster for kids (and a life saver for mom). Throw in a little preposition practice as well then it is even better. 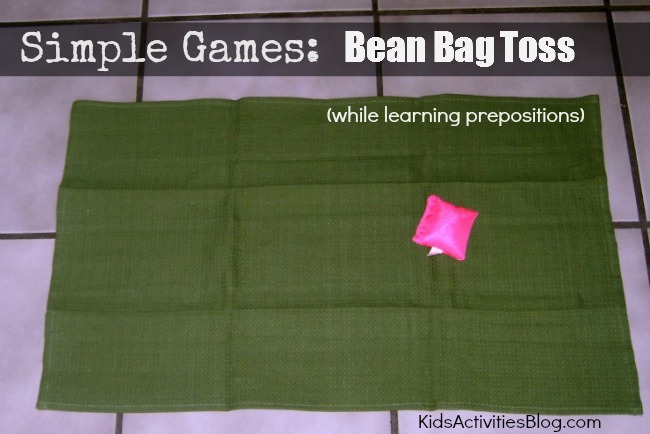 Kids Activities Blog hopes your child enjoys this educational adaptation to the basic bean bag toss game. 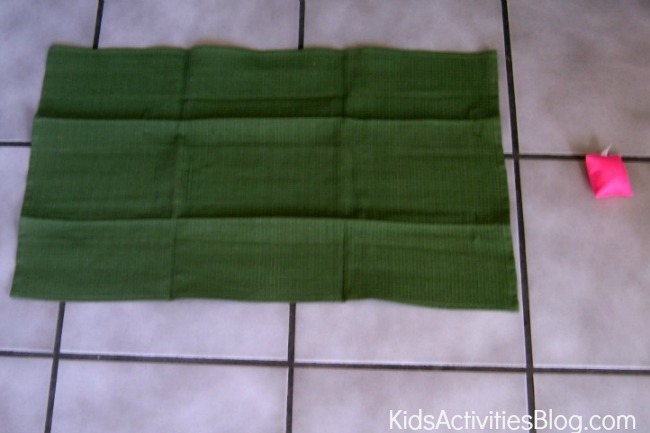 Whether you have children that are “bored” at the end of the day or tired of being inside due to bad weather, a simple dish towel and a bean bag can become a fun activity for them to do. Truly that is all you need to play this simple game that helps children work on gross or large motor skills. It also helps them with prepositions too. Young children can plan the unplanned version of the game. In the unplanned version you throw the bean bag and talk about where it landed. Did the bean bag land on the towel? Did the bean bag land above the towel? Would you say it landed below the towel? Did it land to the left off the towel? Did the bean bag go over the towel? 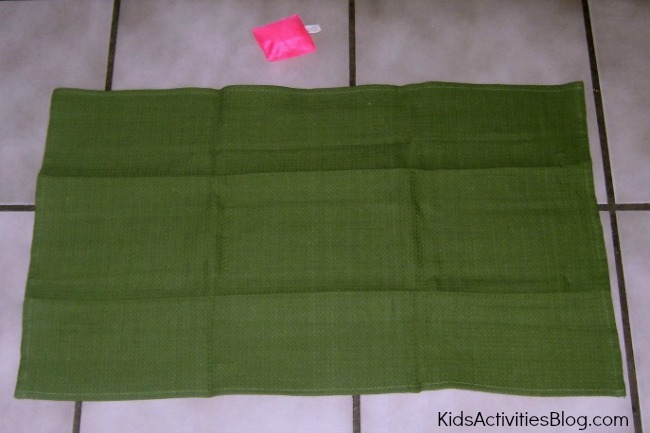 Older children can call out where they are planning to have the bean bag land. Some many be able to get it right where they planned for it to land. Others may need to talk through what happened to bean bag. Did you use to much force when throwing the bean bag? Did you need to throw it harder? Did you look at where you were throwing it when you threw it? If the got it where they wanted it to go, ask them to use a preposition to tell you where it landed. Then ask them to try to have it land in a new location. Some children might enjoy throwing it to the right, above, to the left and below going counter clockwise. Hint: If it is too easy for them to get on the dish towel you might want to try making the dish towel smaller by folding it or moving it farther away. Previous Post: « Headlines Week of March 4, 2013! to send you an email. I’ve got some suggestions for your blog you might be interested in hearing. Either way, great website and I look forward to seeing it improve over time. This is really cool and inspiring for all the parents!